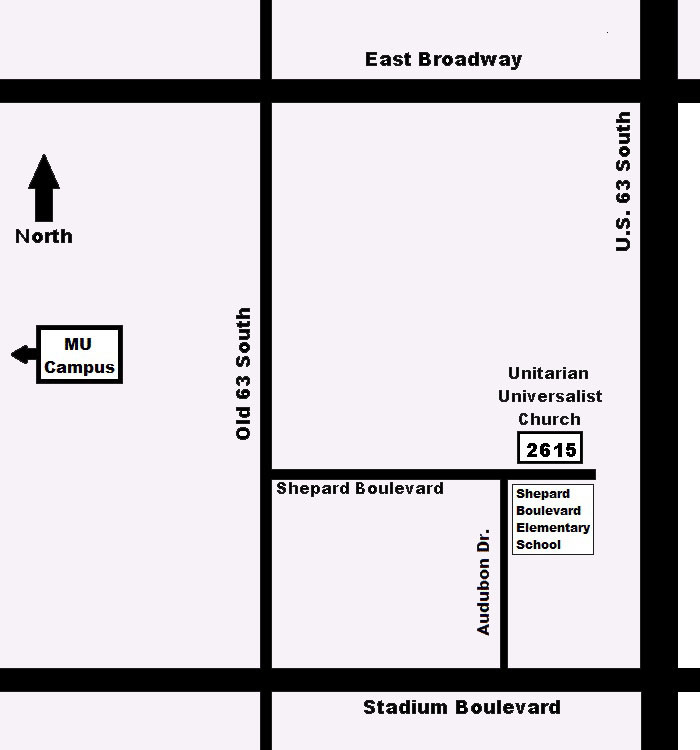 The Unitarian Universalist Church of Columbia, Missouri is a welcoming congregation. Whatever the faiths you have known, or the flags of your heritage, you are welcome here. Whoever you are, and whomever you love, you are welcome here. And, whether you arrived by a short or a long route, you are welcome here. 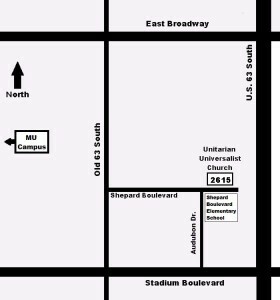 You will find us at 2615 Shepard Boulevard, directly across the street from Shepard Boulevard Elementary School. See map at right. We offer worship services and a religious education program at 9 and 11 a.m. Sundays from early September through late May and at 10:30 a.m. only from late May to early September. When visiting our church, you should plan to dress casually and comfortably. We are an active church with an informal style. Our church is centrally heated and cooled. We have an assistive listening system for those who have difficulty hearing. We do not have an elevator, but both floors of our church are accessible from grade-level entrances. More facilities information. When you arrive, you will find a church where no revealed truths are promoted and no scripture or human being is accepted as infallible. This is a place for searching for truth. But we are believers. We believe in intellectual freedom; we believe in justice; we believe in the inherent worth and dignity of every person; we believe in compassion and concern for each other and the whole world. We believe in commitment to those ideals which make us caring and active in the struggles for human dignity. Because each of our worship services is unique, you may want to plan to attend several services to experience the range and diversity of our thought and action. See our Worship Services page for a general idea of what to expect during worship. When you arrive, you will cordially greeted, invited to sign the guest book in our Greeting Area adjacent to the Sanctuary, and offered a name tag. Signing the guest book will ensure that you are added to our newsletter mailing list and that a permanent name tag is prepared for your future use. 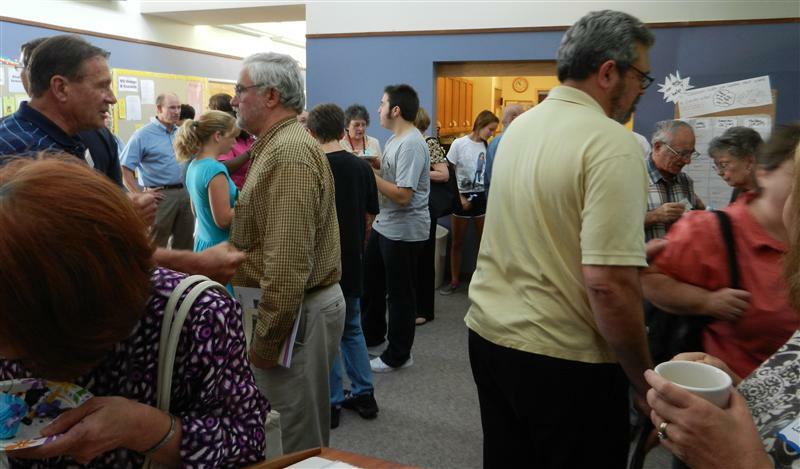 You are invited to join us after worship services for coffee and conversation in the Greeting Area. See photo below. Feel free to ask questions of any member about who/why/where/how things are, or you can call our Church Administrator, Suzanne Clark, at 573-442-5764, or send her an email.